"Carbon capture" technologies - chemically trapping carbon dioxide before it is released into the atmosphere - is one approach. In a recent study, Cornell University researchers disclose a novel method for capturing the greenhouse gas and converting it to a useful product - while producing electrical energy. Their paper, "The O2-assisted Al/CO2 electrochemical cell: A system for CO2 capture/conversion and electric power generation," was published July 20 in Science Advances. 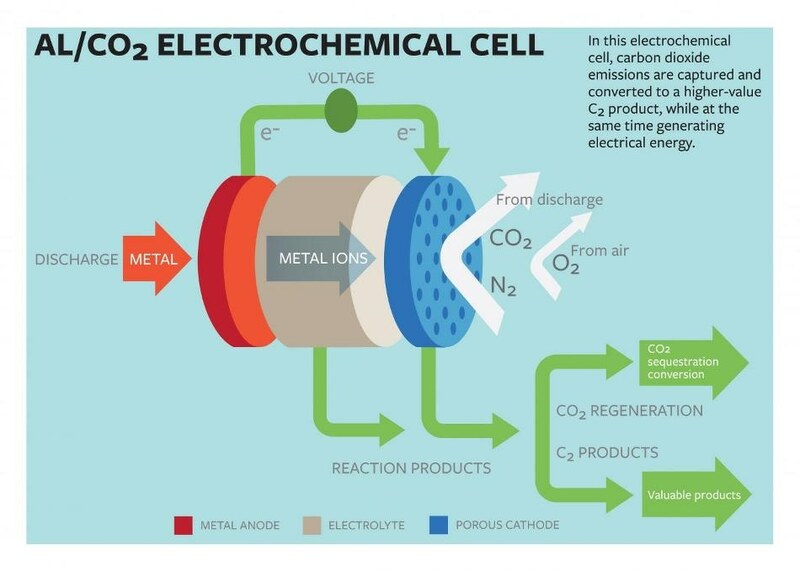 The group's proposed cell would use aluminum as the anode and mixed streams of carbon dioxide and oxygen as the active ingredients of the cathode. The electrochemical reactions between the anode and the cathode would sequester the carbon dioxide into carbon-rich compounds while also producing electricity and a valuable oxalate as a byproduct. "The fact that we've designed a carbon capture technology that also generates electricity is, in and of itself, important," he said. "One of the roadblocks to adopting current carbon dioxide capture technology in electric power plants is that the regeneration of the fluids used for capturing carbon dioxide utilize as much as 25 percent of the energy output of the plant. This seriously limits commercial viability of such technology. Additionally, the captured carbon dioxide must be transported to sites where it can be sequestered or reused, which requires new infrastructure." "A process able to convert carbon dioxide into a more reactive molecule such as an oxalate that contains two carbons opens up a cascade of reaction processes that can be used to synthesize a variety of products," Archer said, noting that the configuration of the electrochemical cell will be dependent on the product one chooses to make from the oxalate. Al Sadat, who worked on onboard carbon capture vehicles at Saudi Aramco, said this technology in not limited to power-plant applications. "It fits really well with onboard capture in vehicles," he said, "especially if you think of an internal combustion engine and an auxiliary system that relies on electrical power." A current drawback of this technology is that the electrolyte - the liquid connecting the anode to the cathode - is extremely sensitive to water. Ongoing work is addressing the performance of electrochemical systems and the use of electrolytes that are less water-sensitive.